Idle Station There are 2 products. 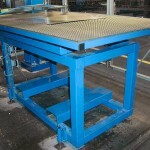 The Idle Station is a device for idling and relocating stamped panels in between the presses. 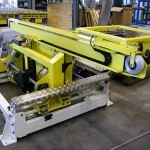 It has programmable axes so that height, side shifting, rotating, tilting and separation can be adapted. The simple and solid construction is also space saving. The Destacker Idle Station is a device for locating blanks, both single and double, not attached. The idle station is normally used in a Destacker application together with a vision system. Application for double sheet control can be integrated. It has programmable axes and a simple and solid construction. © 2014 Binar Olofström AB.